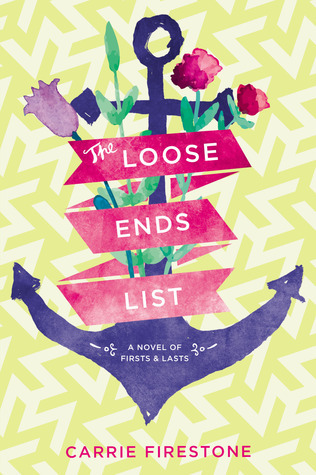 Goodreads says, "Seventeen-year-old Maddie O'Neill Levine lives a charmed life, and is primed to spend the perfect pre-college summer with her best friends and young-at-heart socialite grandmother (also Maddie's closest confidante), tying up high school loose ends. Maddie's plans change the instant Gram announces that she is terminally ill and has booked the family on a secret "death with dignity" cruise ship so that she can leave the world in her own unconventional way - and give the O'Neill clan an unforgettable summer of dreams-come-true in the process. Soon, Maddie is on the trip of a lifetime with her over-the-top family. As they travel the globe, Maddie bonds with other passengers and falls for Enzo, who is processing his own grief. But despite the laughter, headiness of first love, and excitement of glamorous destinations, Maddie knows she is on the brink of losing Gram. She struggles to find the strength to say good-bye in a whirlwind summer shaped by love, loss, and the power of forgiveness." You guys know I am all about a summertime read and this one has recently caught my eye. I think it will definitely tug on my heartstrings. What do you guys think? I hadn't heard of this one before but I think it sounds really good (and really sad). Good pick! Thanks, Christina! I like some summertime reads with substance mixed in with my usual fluffy ones. Thanks for visiting. Yes! I definitely think this sounds like a cute/sad/bittersweet, but not shallow summer read :) I hope you like it. My thoughts exactly! Thanks for visiting! Such a pretty cover Christina! This definitely sounds like a you book with the pre-college summer trip, and I can't wait to see what you think! I love this cover too, Jenny! Thanks for dropping by! This sounds like a cute one, Christina, and I love this book cover! I hope you're enjoying Eligible!! I love the cover as well....so simple but perfect for summertime. Thanks for visiting and I am LOVING Eligible. I am hoping to finish it today. I'm glad you agree, Christy! Thanks for dropping by. Wow, this sounds like nothing I've ever read before, and I do love a good close grandmother/granddaughter story. It's bound to be heartwrenching in the end, though. Sounds really good! Me too. I love books that depict special relationships with grandparents. I'm sure it will definitely be heart wrenching! Thanks for visiting, Becky!